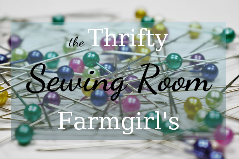 Check out The Thrifty Farmgirls Sewing Room. Here you'll find handcrafted items made by the Thrifty Farmgirl herself! Everything is made on vintage sewing machines.